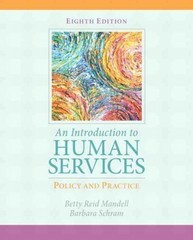 Introduction to Human Services 8 Edition Complete, up-to-date coverage of social welfare programs and policies with special coverage of how history, politics, and the economy shape these programs This text puts the field of human services into a historical context, provides insights into the social welfare field, and gives concrete examples of how primary intervention strategies are put into daily practice in human service agencies. It presents the many options offered in the field of human services and discusses the stresses that a human service worker will face in day-to-day work, with practical suggestions for avoiding burnout. The text compares the U.S. social welfare systems to systems in other countries, and uses a strong multicultural and social systems approach that distinguishes it from other texts. Teaching & Learning Experience Engage Students – Outstanding pedagogy, including examples, cases, anecdotes, and interviews, keeps students interested. Explore Current Issues – Contemporary issues are incorporated throughout the text to provide students with the most up-to-date coverage; topics include: cyberbullying, immigration, and health care reform. Support Instructors – An Instructor’s Manual and Test Bank, Computerized Test Bank (MyTest), and PowerPoint presentations, and BlackBoard and WebCT Test Item File provide instructors with additional support.